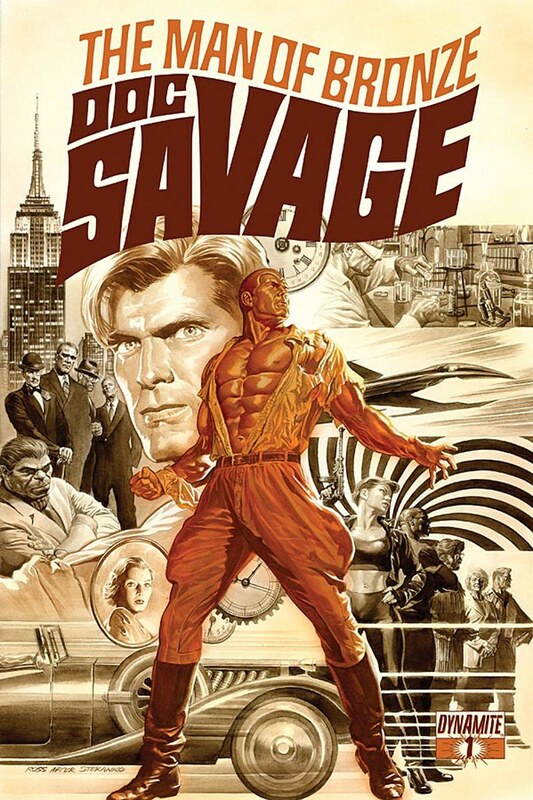 I read some news on Facebook (via Sal Abbinanti) that Dynamite will be publishing a Doc Savage comic at the end of this year! Makes sense as they already publish The Shadow. Alex Ross is doing the covers! I think this is the greatest part of the announcement. The cover for the first issue has Doc Savage in a classic pose with montages of his gang around him -- you can see the Fabulous Five and Pat Savage. The arrangement of this cover reminded me of Steranko's cover for SHIELD #4...and now I see that Ross signed this one "after Steranko". 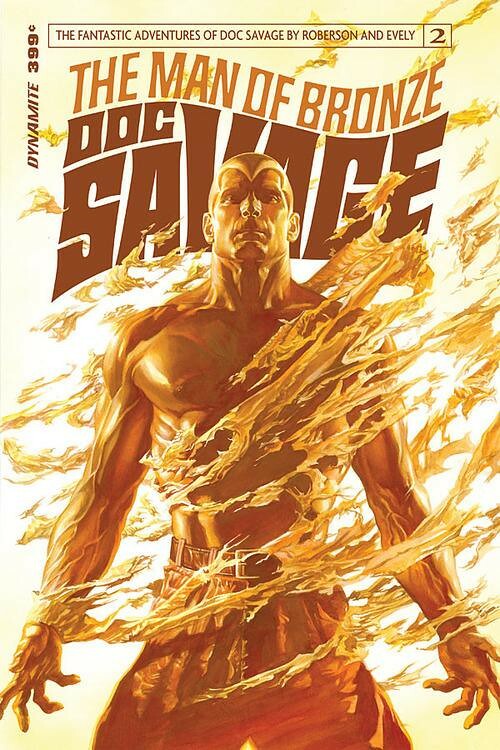 Doc Savage #2 sports a cover that is a direct homage to one of James Bama's paperback paintings. I like how Dynamite created the logo and cover lettering to resemble one of the old Bantam paperbacks. After a little investigative research (Google searching) I found a nifty Pinterest board for James Bama artwork. 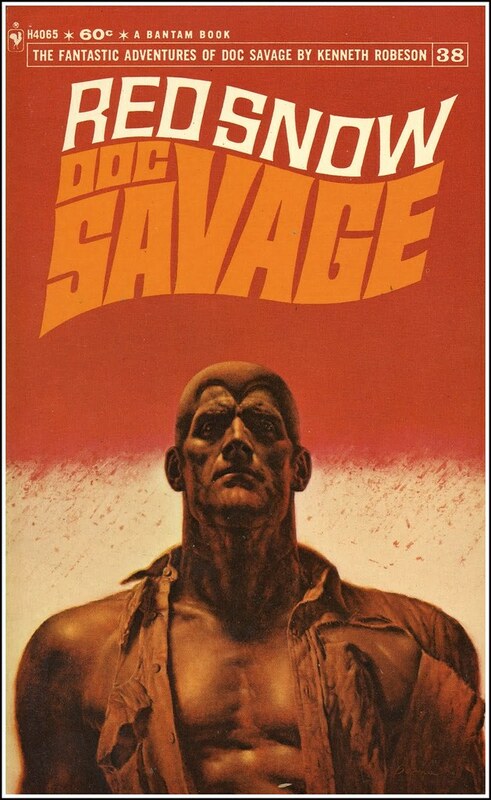 The Bama cover that inspired Ross must have been this cover to Doc Savage paperback #38, Red Snow. I remember buying this one for 60 cents! It was a terrifying image with Doc standing stoicly in front of the red haze. Look at the face and compare some of the details to the face on Ross' painting -- I am pretty sure he was looking at this for inspiration. No idea what to expect from the story, this article on CBR has a small interview with the writer, Chris Roberson. Robeson plans to start the story in the 30s and bring Doc into the present day? Doc would have to be over 100 years old! There would have to be an "Infinity Formula" keeping him alive or else time travel -- something that I think DC Comics tried in their revival decades ago. Nuff Said!